The display of PocketBook Pro 912 is made on E Ink electronic paper technology. The distinctive feature of this revolutionary technology is a maximum visual similarity with a paper page: display is not active, only reflected light is used. 9,7" E Ink® Vizplex display with resolution of 1280x825 pixels supports 16 grades of grey that enables displaying complicated texts and illustrations. Compared to an ordinary LCD displays, E Ink displays are free from blinking that causes eye strain. As a result the eyes don’t get tired while reading if compared to reading on electronic devices with displays of other types (communicators, phones, notebooks or PCs). You can read on E Ink display for hours without fearing for your eyesight. The PocketBook Pro 912 users experience no such problems as inconvenient view angles or light glares. You can read on this e-reader even in the brightest sunlight. Also, you can switch on a display refreshment mode without fading by activating a proper function in the settings of your reader. A single battery charge provides PocketBook Pro 912 with enough power to read 20 standard books, about 14,000 page turns, or a month of two-hour daily reading. PocketBook Pro 912 has a built-in Bluetooth 2.1 for information exchange. Internet connection is being realized via Wi-Fi 802.11 (b/g). For information storage from 0.8 Gb to 1.2 Gb of 2 Gb are available for the user and SD slot supporting memory cards up to 32 Gb. 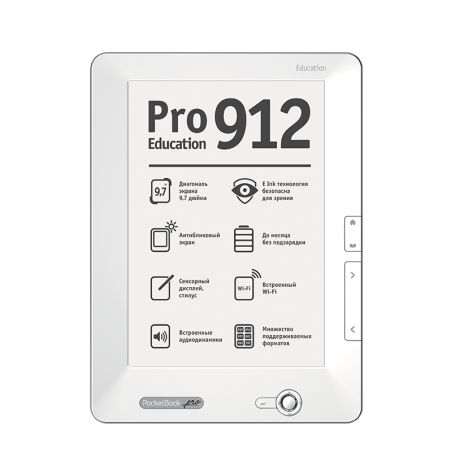 You can operate PocketBook Pro 912 either with the buttons on e-reader’s panel or with a sensor display. It is a great advantage of PocketBook readers that you can assign various functions to nearly every key button of the device: both in press and hold modes. PocketBook Pro 912 is based on Linux operation system. Device’s software is being constantly upgraded that allows being innovative in e-reading. Each PocketBook Pro 912 has 500 free pre-installed books in a number of European languages. The device supports Text-to-Speech converter which can read a book to you in 4 languages of 26 available for download at the PocketBook International site.